Increased worker safety and comfort - including ergonomics in the design of platforms will decrease injuries. 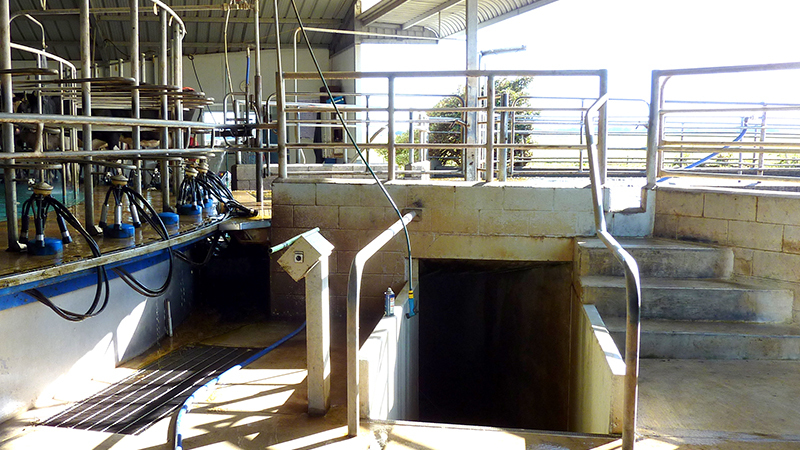 Platforms and pipework which are designed correctly will position cows in a way that decreases the danger to milkers. Height should be between 850–1000 mm high (so forearms more-or-less horizontal when cupping). Breast rail should be approximately 800mm high. Feed bins if present should have their bases 200mm lower than the breast rail. Gap between dummys (where clusters are hung) is minimum of 650mm. 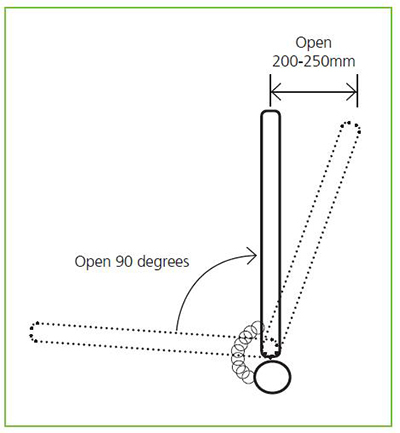 Bail length is 1500-1650mm long (too long allows heifers to stand too far forward). Safety switch for entering and exiting cows to prevent crushing (spring loaded for auto-restart). The D-gate is positioned between the platform entry and platform exit. Its primary purpose is to protect cows that have not exited completely from being crushed. D-gate post is positioned approximately 500mm from the platform edge (length of gate). The gate should open 30º in the opposite direction, so a cow can push into bail early, thereby improving cow flow. 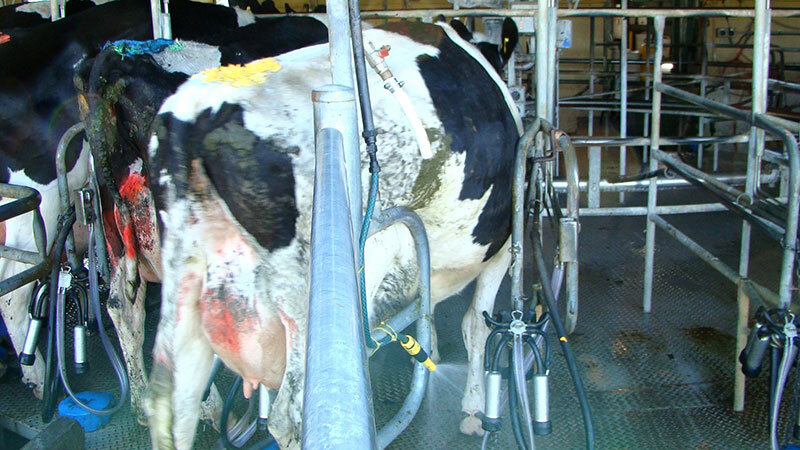 Photo showing D-gate opening 30 degrees to give the cow more time to enter the bail. Cow entering the bail before it is fully presented. It is important the cups-on area is well set up to maximise cow flow and provide a comfortable work environment for the milker. 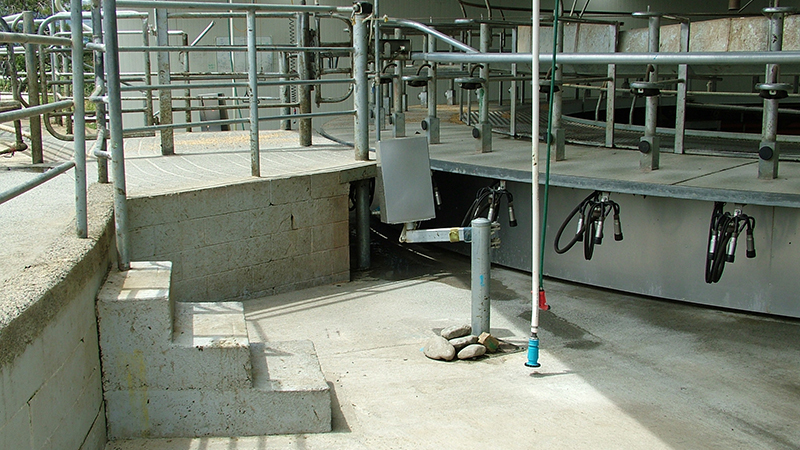 Control console (for backing gate, platform speed etc) is to the right side (left on clockwise rotaries) of the milker and orientated so that cows cannot see screens or flashing lights. 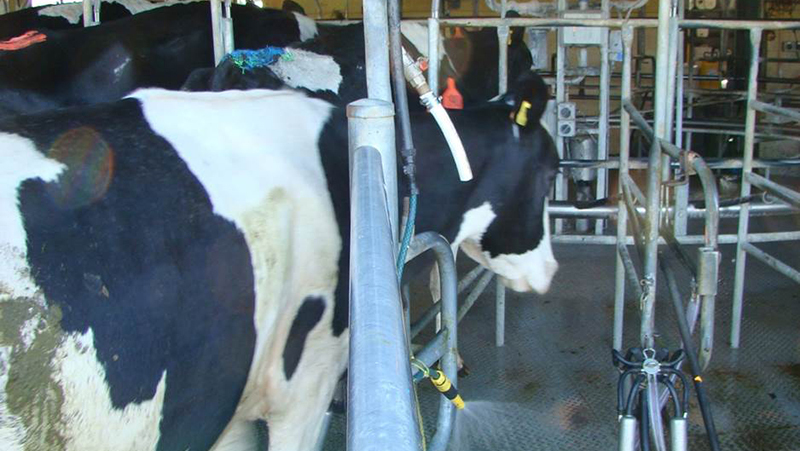 Milker should be able to side step to use controls, without turning to face herd in the yard. Cows are less likely to walk towards a person facing them directly than if they keep their back turned towards the cow. 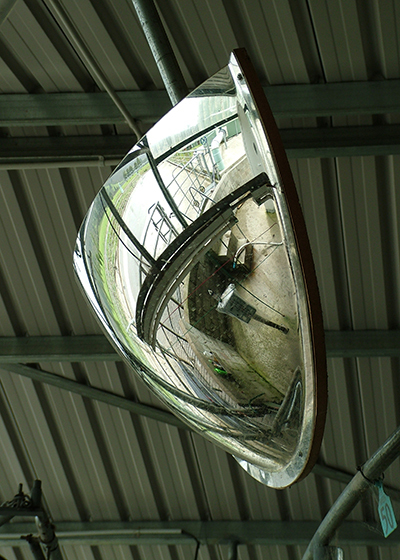 Use a mirror for checking cows in the yard and backing gate placement. There are wide concrete stairs for safety. Add a no-slip surface if required. Use a mirror for checking cows in the yard and backing gate placement, rather than looking into or entering the yard (disrupting cows).